KIEV, Ukraine -- Former Ukrainian prime minister Yulia Tymoshenko warned President Viktor Yanukovich in an open letter from jail on Monday against selling gas pipelines to Russia, saying such a move would strip Kiev of leverage with Moscow. Ukraine has sought to negotiate cheaper Russian gas supplies for more than a year and government and industry sources say Moscow insists on getting a stake in Ukrainian pipelines that ship Russian gas to Europe. Kiev has so far refused to do this but Yanukovich's government is in a difficult position as the price of gas is rising under the current agreement, stretching state finances at a time of global economic downturn. Ukraine subsidises gas and heating supplies to households so dropping the subsidies would mean political suicide for Yanukovich's Party of the Regions as it prepares for a parliamentary election in October 2012. 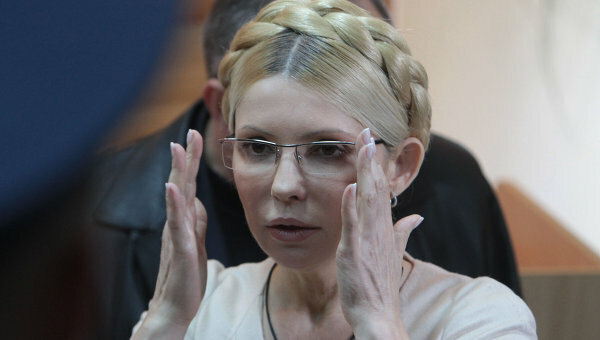 "...Don't you dare sell the gas shipping network," Tymoshenko wrote. "This is our last strategic resource." Yanukovich, who narrowly beat Tymoshenko in the February 2010 presidential election, has accused her of betraying national interests by brokering a 2009 gas deal with Russia under which Ukraine pays a price linked to that of oil. Kiev is paying Russian gas giant Gazprom about $400 per thousand cubic metres and the price will rise to $485 in the next quarterly adjustment. Tymoshenko was sentenced to seven years in prison in October on charges of abusing her powers in forcing through the 2009 agreement. She has dismissed the charges as politically motivated, a view shared by the European Union. In Monday's letter she sought to turn the tables on Yanukovich. "You are only being admitted to Gorki (the residence of the Russian president) because this (gas pipeline) system still belongs to Ukraine," she wrote. "Once you lose it, you will have no arguments to make for yourself or for the country." Ukraine transships the bulk of Russian gas bound for Europe and transit volume stood at 95 billion cubic metres in January-November this year. Previous disputes between Moscow and Kiev disrupted such shipments, prompting Russia and the EU to develop alternate shipping routes such as Nord Stream which was launched this year and goes through the Baltic Sea. On Monday, Gazprom Chief Executive Alexei Miller said another alternative pipeline, South Stream, would be built across the Black Sea if talks with Ukraine fail. Ukrainian officials say the country could eventually lose all transit volumes -- and revenues -- unless it allows Gazprom to buy into its pipelines. "Turning an economic asset into a fetish is ridiculous," Oleg Voloshin, the head of Information Department at Ukraine's Foreign Ministry, told the Gorshenin Institute think tank in comments published on Monday. "This is just an economic asset and it must work. It is not important who owns it." However, local media reports indicated this month Gazprom was pressing for a Russian-Ukrainian joint venture. Gazprom said on Monday talks with Ukraine would continue on Jan. 15.